Even if someone has heard a clear explanation of the gospel and not responded in faith, it’s still possible to have good gospel conversations with them. Good evangelism training tells us to move on from those who show no interest in the gospel and talk to someone else. While that’s true in “walk up” situations where you’re sharing your faith with strangers, it doesn’t work with family members, coworkers or neighbors we care about. We can’t just “move on” from the people God has placed in our lives and given us influence over. So let’s look at ways to continue to have gospel conversations with those who have already heard without necessarily giving them the same gospel explanation over and over again. Some of the best gospel conversations you’ll have are at the intersections of things you are already fluent in, certain gospel implications, and what people generally talk about. That’s a gospel conversation sweet spot. Let’s explore this by finding where we are already fluent. People don’t usually need coaching or prompting to talk about their favorite subjects. Whether it’s a sports team, favorite dish or vacation destination, we actually have trouble shutting up about things that excite us or capture our imagination. We tend to be fully fluent in the topics that really interest us. So why don’t we always feel fluent when it comes to the gospel even though we are passionate about it? Many of us have inherited an inhibition from our culture that keeps us from talking about spiritual matters openly and often. But you can learn to connect the subjects you’re already fluent in with the gospel. Let’s say the themes you find yourself talking most often about are love, community, freedom, purpose and justice. Each of those subjects are affected by the gospel, but how? 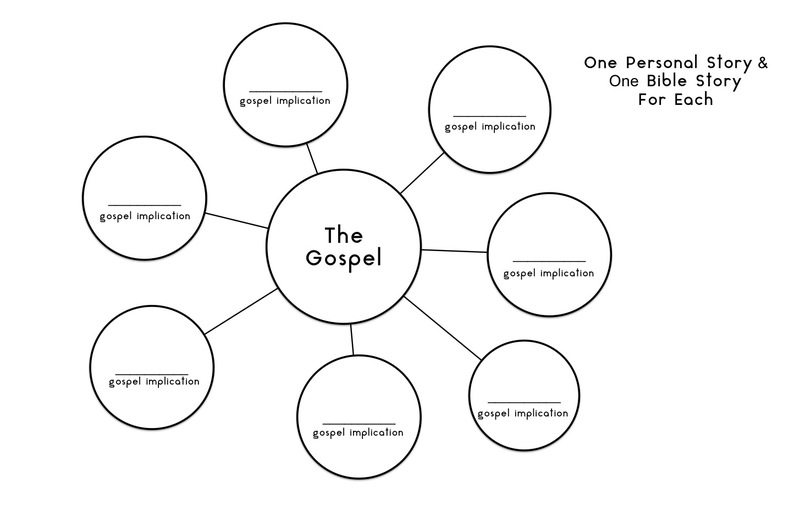 Here are a couple of ways to discover the gospel implication in each area. Is there a Bible story or specific verse that specifically addresses that subject? Do you have a personal story concerning that subject in which your faith was a key character or influence on you? For example, if your subject is “freedom” it won’t be difficult to find stories and verses that discuss freedom in the Bible. Here’s one: 1 Corinthians 8 teaches us that just because you are free to do something, you shouldn’t do it if it hurts others. The breadth of our freedom isn’t determined by our rights but by our love for others. That’s not necessarily how the world views freedom and it’s enough of a contrast to be pretty interesting in conversation. A personal story about a time you forfeited a freedom in the name of love would be powerful as well. So here’s your challenge. Take the subject themes you’re already fluent in and find the gospel implication from scripture and your own faith journey for each. Start with the subjects you notice non-Christians around you having regularly. Use a handout like the one pictured below to help you. People all around us are constantly talking about the gospel…sort of. They may not be discussing the death, burial and resurrection of Jesus Christ but they are talking about all the things the gospel has affected or changed. A gospel conversation is not something we always have to manufacture. We can and should join conversations already in progress and share the gospel’s implication for that subject. It’s not too different from someone saying “Well, I’m from the Midwest and my mother taught me…” when it comes to a certain subject. People wouldn’t think to deem that kind of input as coming out of left field. Is a person’s upbringing relevant? Of course. It’s normal to share how formative experiences have shaped your view about a subject…including your faith! Don’t be shy to say “my faith has really shaped my thinking about this subject” or “I used to think about it one way but now my faith teaches me something else.” You may spark the interest of someone that allows you to share a clear explanation of the gospel in a subsequent conversation. Maybe the person who has heard before is more intrigued by seeing the gospel’s practical effect on our thinking and living. We never know how the words we sprinkle like seeds into a conversation will bloom even in the most cynical listeners. Learn a clear gospel explanation, connect the subjects you’re fluent in with the gospel, and we’ll explore a few more resources and tips in part three.